Many hiking boot owners are surprised to learn that their particular pair of boots aren’t waterproof. If that sounds like you, we recommend taking the time to waterproof your boots on your own. Waterproofing can be used to maintain boots over the years and can also make a non-waterproof boot keep water out. Of course, you could always return your boots (assuming they are new), and just buy a new pair of waterproof hiking boots. But if you love your current boots and want to waterproof them on your own, read on. Waterproofing boots is not something that is universal for all hiking boot materials. For example, the boot oil that you use to waterproof your leather boot may ruin one made of suede and using greases or waxes to waterproof your boot may decrease its breathability. 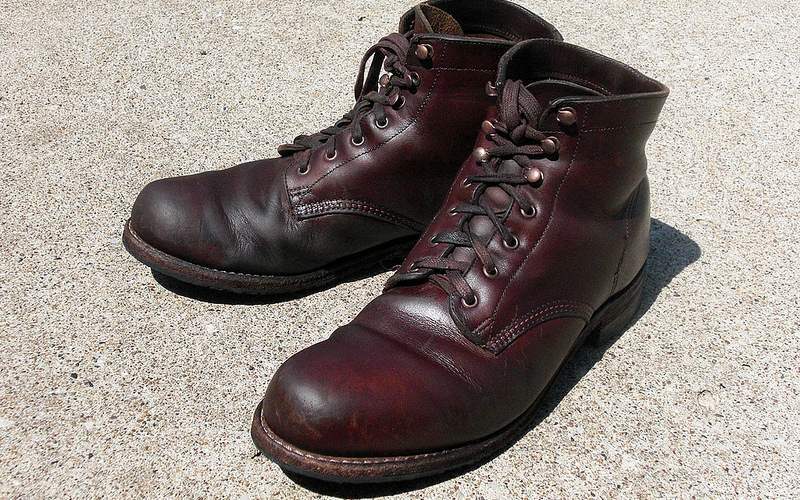 When you have boots that are made of full-grain leather, dubbin wax or another recommended boot wax may be best. You should also condition the leather, to help prevent cracking that will effect waterproofing. Mink oil also works well for waterproofing and conditioning these types of boots. If you have suede or Nubuck walking boots, a waterproofing spray is our recommendation. Choose one designed especially for these types of boots, to prevent the softness or fuzziness from going away. We like Moneysworth & Best Suede & Nubuck Protector. Sno-Seal is another great option for waterproofing leather, as well as waxed fabrics and cotton. This protects your boots from snow, rain, mud, and more. Be careful, not all boots will accept a waterproof spray gracefully! Before you clean your hiking boots, you will want to remove the boot laces. This serves two purposes. Removing the laces allows you to access the areas under and around the laces and it prevents the waterproofing materials from damaging your boot laces. Start by knocking off any loose chunks of dirt and then apply a boot cleaning gel. Allow this to sit for as long as the bottle recommends and use a cloth (or a nylon scrub brush for especially dirty boots) to clean them. Rinse this off and allow the boots to dry slightly before conditioning or waterproofing. For boots that have a breathable but waterproof membrane like GoreTex, cleaning these areas is enough. The water will re-activate the boot’s waterproof abilities, while applying a treatment will block the membrane and decrease the air flow of your boot. Leather has naturally water repelling abilities, which means you can waterproof them by maintaining the leather. When conditioning boots, you first want to make sure they are clean. Remove your laces and then use a brush to remove excess dirt and wipe with a wet cloth if necessary. If you do get the boots wet, it is best to let them dry overnight before conditioning so they are not too wet. Then, take your conditioning oil and thoroughly massage it into the boot, allowing it to absorb deep down into the leather. Check out the video below for a how-to instructional on conditioning leather boots. Be careful not to over-condition your boots though. If leather becomes too soft it will not offer the support you need on the trails. If you want to know how to waterproof your boots and/or shoes so they absorb the most sealant, do it when they are slightly damp. While this has the downside of not allowing you to see where the solution has been applied, it allows the boot material to absorb the solution or wax better. Please note that running water over them usually does not saturate them enough, you need to let the water soak in. If you are working with a solid waterproofing treatment like a wax or oil, take the solution and put it on a clean soft cloth. Gently massage the treatment into your boot. If you are working with a spray, refer to the can for specific manufacturer’s instructions. In most cases, hold the can or bottle about 5 centimeters from the surface of your boot. Evenly coat the entire boot. Once you have applied waterproofing treatment to your boots, you will need to dry them thoroughly before wearing them. It is ideal that you let them air dry, but you can put the shoes in front of the fan to speed the process up (or pack them with newspaper). Never apply heat from a hair dryer or other heating element to your boots because this can cause the leather to crack. If it’s winter time and the air is particularly dry, you may want to considering boiling a pot of water or using a humidifier. The right hiking boots can last for years when they are maintained properly. Proper hiking boot maintenance includes regular cleanings and waterproofing at regular intervals.